Kalank promotions on Thursday saw Alia in a red suit by Ekaya. Loved the suit, the middle pated hairdo with the big earrings, not so much. Also, why is it that the ladies are so dressed up for these promotions in desi but the men seem to get away with denims (see inside)? 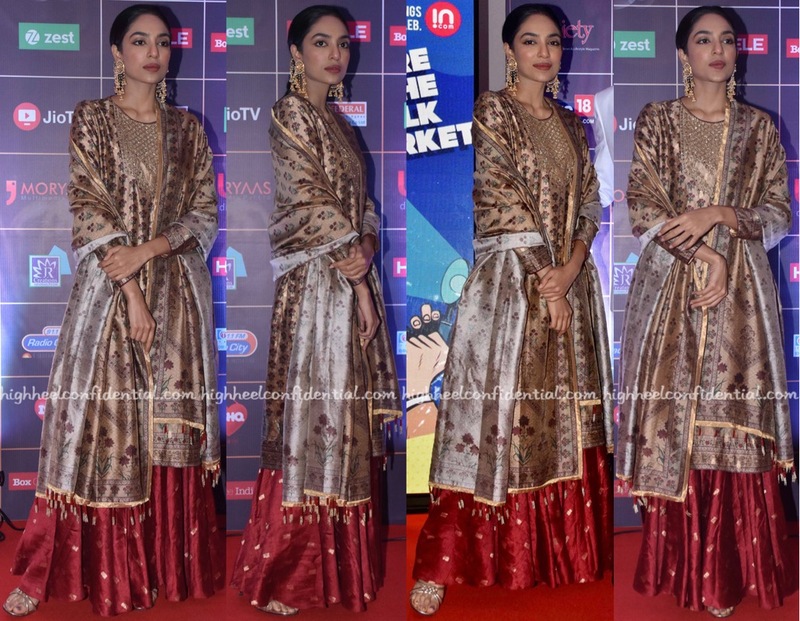 For her appearance at a recent awards event, Sobhita picked a sharara by Ekaya to wear. Wearing her hair back, she rounded out the look with a pair of statement-y earrings. In a sea of gowns and occasional saris, it was refreshing to see Sobhita pick a sharara to wear. She looked nice. Sobhita attended the press meet for her upcoming web series wearing a red sari by Ekaya with a green full-sleeve blouse. I do love that she picked a sari but I don’t quite the blouse. To me, it felt a lil’ jarring. Having said that, I do appreciate that she opted for a sari. Keerty attended the TSR TV9 Awards wearing a gold Ekaya benarasi sari with a red Sailesh Singhania blouse and mogra in her hair. She looked so lovely!